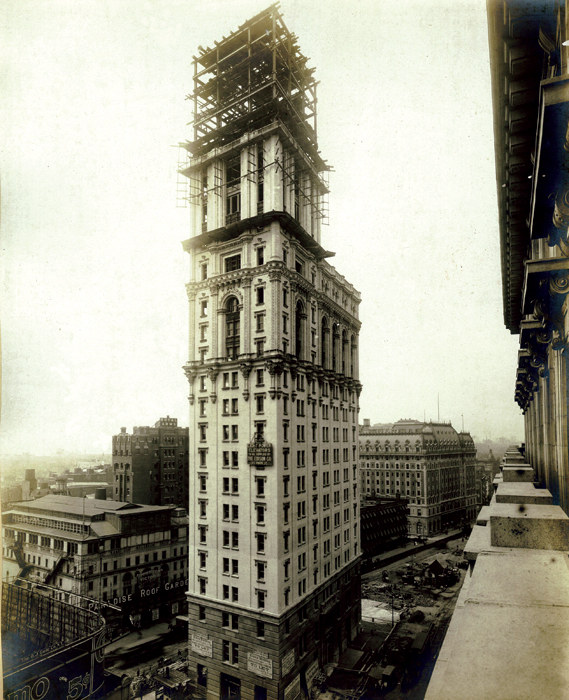 Construction photograph of the New York Times Tower, 1904. The Collection of the Partners of HLW International. The New York Times Tower opened with a fireworks display in Times Square on New Year's Eve, 1904. Designed by the architect Cyrus Eidlitz and his partner Andrew McKenzie, the Tower redefined the landscape of the newspaper industry and the city itself. Built at the direction of the paper's owner and publisher Adolph Ochs, who had purchased the ailing New York Times in 1896, the new building was part of his larger plan to reinvigorate the newspaper. Ochs wanted a building to "wake up the nation" and to call attention to the paper's resurgence under his leadership. Ochs began his search for a site in 1902, and the first options he considered were close to City Hall and Newspaper Row: indeed, one was on the block of the future Woolworth Building. But rising real estate prices pushed Ochs uptown to an area known as Longacre Square-a neighborhood of cheap theaters and hotels on the brink of a major transformation due to the opening of the IRT subway. On a triangle of land, much like that of the Flatiron Building, that was bounded by Broadway, Seventh Avenue, and W. 42nd St., Eidlitz & McKenzie created an iconic skyscraper with a base that rose fifteen stories and a tower at the south end that added ten floors, including a rooftop observatory for Ochs. The design was based on Giotto's campanile at the Florence Cathedral, which the publisher had admired during his European travels. The building's ornate façade of robust Gothic and early Renaissance details was created in a light cream terra cotta, much like the later Woolworth Building. Terra cotta was considerably cheaper than stone and could be easily sculpted into rich decoration or pressed into molds for mass production. Terra cotta was typically lighter and cheaper than stone, especially when molds were extensively reused, and could carry a significant amount of detail. It was an ideal material for such large buildings as the Woolworth and Times Tower to maintain uniformity of color, to emanate decorative gothic flourishes, and to reduce construction costs.